NEW YORK/TORONTO (Feb. 18, 2015) – A super weekend of mixed-martial-arts and kickboxing action is on tap this weekend on Fight Network, the world’s premier combat sports network dedicated to 24/7 coverage, including live airings of M-1 Challenge 55 and KSW 30: Genesis, as well as pre and post-fight coverage ofUFC Fight Night 61: Bigfoot vs. Mir. M-1 Challenge kicks things off Saturday morning (Feb. 21) at 10 a.m. from Tbilisi, Georgia. 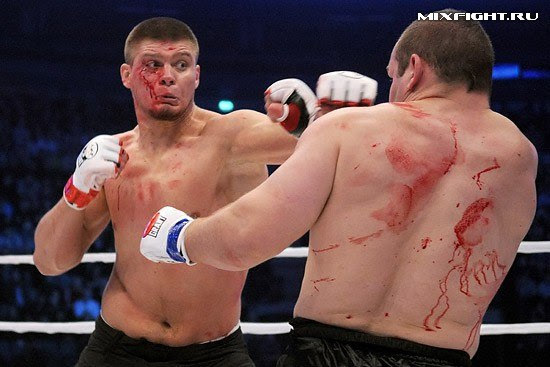 The main event pits past M-1 Challenge heavyweight championDenis Smoldarev (9-1-0), known as the Brock Lesnarof Estonia, against Maro Perak (23-4-1). Former M-1 Challenge heavyweight champion Kenny “Deuce” Garner (14-8-0), fighting out Port St. Lucie, Florida, takes on Chechnya prospectAslambek “Titan” Musaev (5-1-0). Also fighting on M-1 Challenge 55 is 20013 WMMA champion and hometown favorite Nodar Kudukhashvili (7-1-0) vs. American middleweight Luigi “The Italian Tank” Fioravanti (25-12-0) and undefeated Ukrainian featherweight contender Pavel Vitruk (12-0-0) vs. Germany’s Max Coga (10-3-0), as well as unbeaten lightweights Artiom Damkousky (19-0-0), of Belarus, vs. Azerbaijan challenger Heydar Mamedaliyev (7-0-0). The MMA action continues on Fight Network at 1 p.m. ET with the live airing ofKSW 30: Genesis from Posnan, Poland. Welterweights take the spotlight as hometown hero “The Tasmanian Devil” Borys Mankowski (16-5-1) faces Russian foe Michail “The Lonely Wolf” Tsarev (29-4-0) in the main event. In the co-feature, Rafal Moks (10-6-0) meets Aslambek Saidov (15-4-0) in a battle of Polish fighters. Saturday night’s exciting programming on Fight Network continues at 5 p.m. ETwith the showing of Ring of Combat 47 from January 24, 2014 in Atlantic City, NJ, featuring American lightweights Chris Wade vs. Pat Defranco and Frankie Perezvs. Mike Santiago. Fight Network’s highly acclaimed news shows, Fight News Now: MMA Edition andFight News Now Extra, respectively, follow at 8:00 and 8:30 p.m. ET. Final Fight Championship: Futures 1 MMA, from April 1, 2014 in Croatia, commences and 9:00 p.m. ET the furious action concludes with Final Fight Championship: Futures 1 Kickboxing, starting at 11 p.m. ET, from March 2, 2014 in Croatia. The UFC takes center stage Sunday on Fight Network. A live pre-fight show for UFC Fight Night 61: Bigfoot vs. Mir begins at 5:00 p.m. with a live post-fight show airing at 11:30 p.m. ET with highlights and the live press conference. Brazilian heavyweight Antonio “Bigfoot” Silva (18-6-0) fights at home in the UFC Fight Night 61 main event against former UFC heavyweight champion Frank Mir(16-9-0), fighting out of Las Vegas.